Does Your Deodorant For Men Pass The Sniff Test? It’s 3 o’clock in the office, and suddenly you start to recognize a familiar smell. Could it be the guy who sits behind you and eats too many Funions, or maybe the guy who goes on jogs on his lunch break? Nope. The body odor is coming from you, and by now, everyone is starting to notice. Deodorant for men matters. Deodorant is no silly perfume. Skimping on your deodorant is just asking for trouble. Whether you’re using high-strength ZeroSweat from Amazon.com or all natural Kaiame’s from Amazon.com, you need something that works. Not all deodorant for men brands are created equally though. Below we discuss the top five antiperspirants and deodorant for men, who should use them, and how best to use them. Then we’ll explain the key differences between deodorant and antiperspirant and why you might use one versus the other. What is the best deodorant for sweating armpits? What kind of deodorant should I use to stop sweating? What is the best deodorant for men with sensitive skin? We’ll answer all that and more below. Speed Stick Solid Deodorant is the perfect compromise, one of the best deodorant for men. It’s a deodorant–not an antiperspirant–but it’s far more effective than many of the organic brands like Tom’s which either make your armpits smell worse or wear off midway through the morning. Plus, it won’t leave white marks or become slimy after a workout. While Speed Stick isn’t organic, it won’t clog up your sweat glands, and it certainly doesn’t contain aluminum. In fact, it has a relatively short list of ingredients. 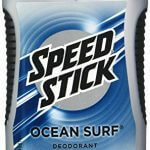 Unlike many organic deodorants though, Speed Stick lasts all day long. If you work in an office, you can slap on some Speed Stick and walk out the door confident you won’t have to hide your pits away. Lastly, because it’s only deodorant, Speed Stick is a great deodorant for men for sensitive skin. It feels smooth, and it will never leave you with a red, itchy rash. Check out Speed Stick Deodorant on Amazon! 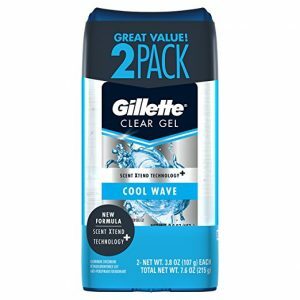 Gillette Cool Wave Clear Gel Men’s Antiperspirant and Deodorant is a classic. It’s been around for years, and those who use it know that it’s reliable. Whether you’re doing heavy labor, hitting the gym, or running for the bus on a hot summer day, Gillette Cool Wave has you covered. The mild, fresh scent is pleasant but not overpowering. The subtle, understated fragrance is attractive but doesn’t call attention to itself like Axe brand products, for instance. Plus, it easily lasts all day, so there’s never any need to reapply. In fact, it’ll cover you even if you miss one morning because it lasts for a full 48 hours. You’ll especially love this deodorant/antiperspirant though because it’s a gel. The gel rolls on smoothly, and it never stains your clothing. Say goodbye to white streaks and yellow armpits. It feels cool against the skin, and while you need to let it dry before putting on your shirt, it’s gentle even on sensitive skin. If you’ve never tried gel deodorant, this is the one to try because it’s simply so refreshing. Check out Gillette Antiperspirant on Amazon! Excessive sweating is downright embarrassing. Known as hyperhidrosis, excessive sweating can make social situations unbearable and getting dressed in the morning impossible. If you suffer from constant perspiration, you know that certain colors, materials, and patterns are totally off limits to you if you want to be able to lift your arms up past your elbows. 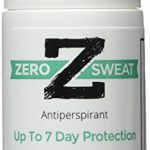 ZeroSweat Antiperspirant is a clinical-strength deodorant for sweat. If you thought that expensive surgeries or injections were your only hope, than think again. ZeroSweat Antiperspirant can absolutely block excessive sweating for days at a time. In fact, some find that they can go a week without reapplying and then another week only using regular deodorant for men. However, this is not intended for anyone with sensitive skin. Even men with normal skin often experience a rash the first time they use it. That being said, if you follow the directions, you can minimize irritation. Don’t apply after shaving or following a shower, and make sure the area is completely dry and free of any cuts. If you can bare the itch the first time you use the product, you’ll love it, but it does it will be uncomfortable at first. So, if you’re ready to start dressing how you like without worrying about pit stains, click on the button below and say goodbye to wet armpits. Check out ZeroSweat Antiperspirant on Amazon! You probably picked up some Arm & Hammer last time you tried your hand at baking, but as it turns out, baking soda has been used for decades to neutralize odors. For that matter, it can also help whiten your teeth and wash residue out of your hair. This deodorant for men is a powerful alternative to harsh soaps and cosmetics. 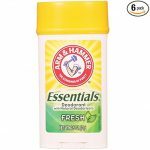 Arm & Hammer Essentials Natural Deodorant uses the power of baking soda, bicarbonate of soda, and plant extracts to keep you smelling fresh all day long. While it won’t prevent you from sweating, it is completely free of parabens, aluminum, colorants, and animal-derived ingredients. So you can wear Arm & Hammer proudly knowing it won’t shoot your medical bills through the roof in another forty years. While this deodorant for men won’t last 24 hours, you can go at least 8 hours before having to reapply. Feel free to exercise, attend meetings, walk around in the heat without ever worrying about smelly pits. 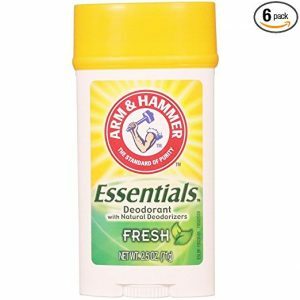 Check out Arm & Hammer Deodorant on Amazon! 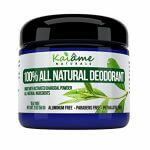 Kaiame Naturals Best Natural Deodorant is free of aluminum, phthalates, parabens, and troubles. It’s the perfect natural alternative for anyone who has sensitive skin and does their best to avoid products made with harmful chemicals and probable carcinogens. The main active ingredient in this deodorant for men is charcoal. Because it’s made with carbon, charcoal can purify the skin of oil, dirt, and grime. It can even absorb up to 1,000 times its own weight in moisture keeping you clean and dry for hours on end even if you have hairy pits. However, this is a deodorant and not an antiperspirant. This deodorant for men won’t prevent you from sweating–it will only keep you from smelling. Customers reported that Kaiame’s was more effective and longer-lasting than Tom’s, the competitor brand, and comes in two lovely scents: tea tree and lavender. While it does sometimes need to be reapplied during the middle of the day, it will mask body odor. This deodorant for men is not made with wax, so it can’t be used as a roll on deodorant. You’ll have to scoop out a bit with your finger to rub under your arms. Because it’s natural, the ingredients often separate. If they do separate, you simply need to stir them together. If the coconut oil melts, then place it in the refrigerator until it reaches a more paste-like consistency. If using completely natural, healthy ingredients is important to you, but you don’t want to sacrifice on performance, than this deodorant is for you. It’s a bit on the pricey side, but it’s worth every penny. 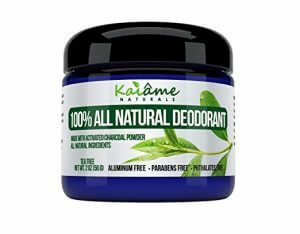 Check out Kaiame Deodorant on Amazon! Are you looking for deodorant or antiperspirant? Know the difference? Deodorant is just designed to remove body odor while antiperspirant blocks your sweat glands. As it turns out, your sweat doesn’t actually smell. Body odor is a result of the fats and proteins in your sweat mixing with the bacteria on your skin. Apocrine glands, known to produce sweat laced with fat and protein, are concentrated under the arms and in the groin area. Unfortunately, these two places are also breeding grounds for bacteria. Deodorant will neutralize the bacteria on your skin, masking the odor. Antiperspirants, on the other hand, use aluminum salts to dissolve the moisture on your skin. These aluminum salts then form a gel that prevents sweat from staining your clothing. You should apply antiperspirant at night when your skin is completely dry so it’s fully activated when you wake up in the morning. Deodorant and antiperspirant have two different roles, and they are not interchangeable. However, many deodorants for men today are deodorants and antiperspirants. While both are healthy and safe to use, there is reason to believe that the aluminum often used in antiperspirant is linked to breast cancer and Alzheimer’s. Though the evidence is not conclusive, it may be a cause for concern and is worth mentioning. So Which Is the Best Men’s Deodorant? Do you use deodorant or antiperspirant? Are you sensitive to certain brands, and do you find that natural alternatives are gentler? What’s your favorite scent? Leave us a comment in the box below to tell us your thoughts about the best deodorant for men.